Mountains Bigger Than Everest Inside Earth’s Mantle. — Ved Lekis, Ph. D., Prof. of Geology, University of Maryland, College Park, Md. Back in the 1970s, scientists were puzzled when seismic tomography showed that waves from some deep earthquakes traveled more slowly from huge regions nearly half way to the center of the Earth’s mantle that surrounds the iron crystal core. Most people have pictures in their head from school of a smooth red ball representing the Earth’s iron core surrounded by another thick orange spherical layer that represents the hot magma extending from the Earth’s core to the surface. 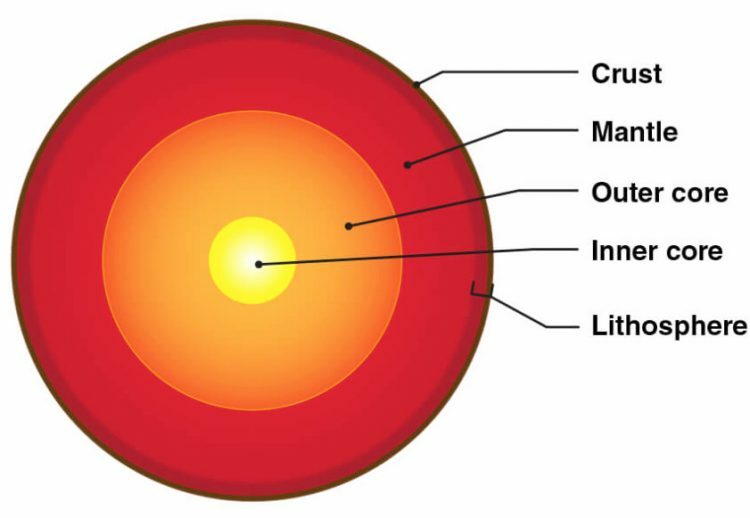 Earth crust, mantle, outer core, inner core and lithosphere smooth circular layers illustration by NASA. But today geophysicsts know that those neat spherical layers are not a true picture of what’s inside our planet. In the recent EOS report on February 27th, 2019, new computer models show two massive mountainous regions the length of whole continents that rise up 100 times higher than Mount Everest. Everest is 29,000 feet high, or 5.5 miles. 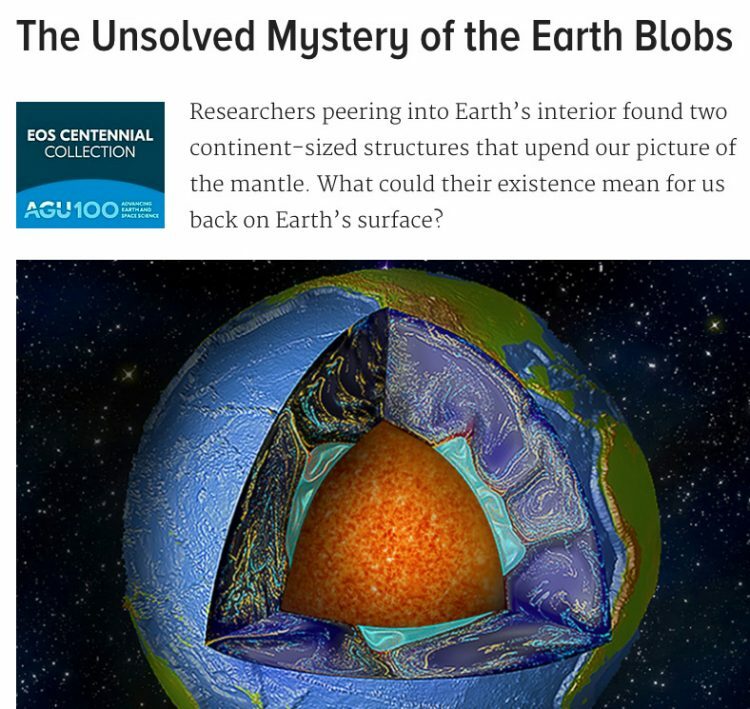 So 100 times that height is 2,900,000 feet — and that is 549 mile-high-mountainous blobs that rise up from the bottom of Earth’s rocky mantle above the molten outer core. If the mountainous blobs were placed on the Earth’s surface, they are so large that the International Space Station, 240 miles above us, would need to navigate around the mountainous blobs. The two, mysterious, 100-times-higher-than-Mt. 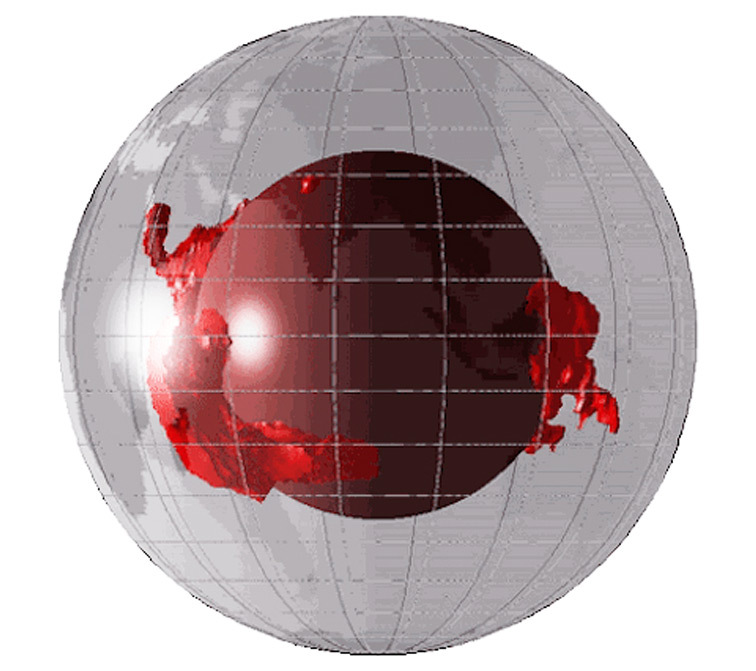 Everest mountainous “blobs” are illustrated atop the Earth’s outer mantle core. Credit: Sanne Cottaar, NASA. Where Are the Blobs and What Are They Made Of? Where are the mountainous blobs inside our planet? One mysterious, mountainous blob lies under the Pacific Ocean. The other is under Africa and part of the Atlantic Ocean. Without yet knowing what the actual composition and density of the huge moutain blobs are, it is difficult to understand their evolution. Were these hot mantle mountains responsible for the periodic supervolcanoes that have contributed to Earth extinction events? 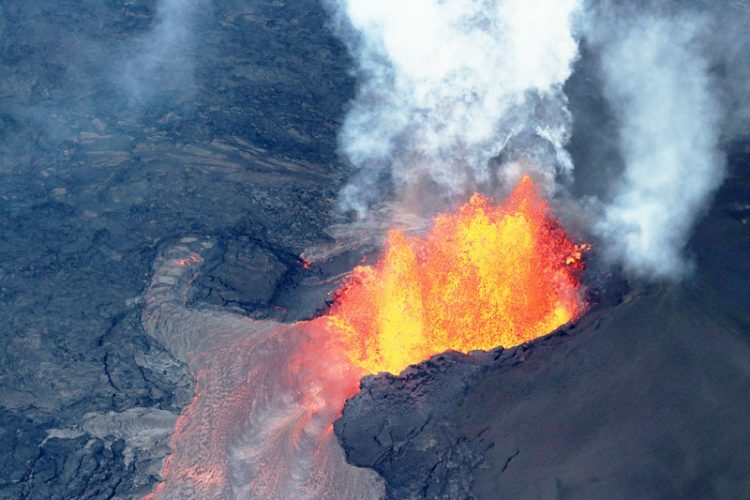 Big Island of Hawaii periodically experiences Kilauea volcano eruptions from “hot spot volcanism,” which some scientists think could be connected to the huge, mountainous blobs growing out and upward from the Earth’s mantle. Image © by iStock.com/Frizi. University of Maryland Geologist and Professor Ved Lekis says Earth is the only planet known to contain plate tectonics, and recent research has suggested that tectonics may help sustain life by delivering a steady stream of nutrients, like nitrogen and phosphorus, to the surface. And yet researchers are not even sure what causes plate tectonic movement, let alone the gigantic mountainous blobs in the Earth’s mantle. 10-17-2017 – Why Has A Maine-Sized Gigantic Hole Opened in Antarctic Weddell Sea? 01-18-2016 – Mysterious Booms Hit South Wichita, Kansas, On January 16th. “Sky Quakes” Were Linked to UFOs in 1950s. 07-13-2015 – Update – Rhode Island Beach “Explosion” — Authorities Say No Evidence from Below Ground and Wonder If Unexplained Air Compression Hit From Above? Injured Woman Released from Hospital. 03-27-2015 – Part 2: Are Inner Core Changes Causing Mysterious Booms and Magnetic Field Changes Leading To A Pole Flip? 02-09-2015 – Part 8: Boom Mystery — More Frequent and Intense? 01-30-2015 – Part 7: Mysterious Loud Booms In At Least 15 States Since Jan. 1st. 12-18-2014 – Could Earth’s Magnetic Poles Flip This Century? Next PostNext Updated Part 1: Is There A Large Pyramid Underground Between Mt. McKinley and Nome, Alaska?